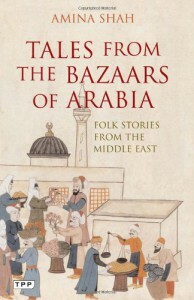 The publisher's title is wrong: most of the stories in this volume come from Afghanistan (the author's home country) and other parts of western Asia. They are a nicely diverse lot, and include almost all the genres of oral telling. There are wonder tales with talking birds and jeweled palaces (e.g. "Prince Attila's Journey to the End of the World"), there are comic stories where a villain gets a comeuppance (e.g. "The Princess, the Vizier, and the Ape"), there are domestic comedies (e.g. "The Precious Pearl"), there are wisdom tales (e.g. "The King, the Dog, and the Golden Bowl"), there are instructive stories about divine providence (e.g. "The Princess of Fantasistan"), there are trickster stories (e.g. "The Bully and the Poisoned Fish"), there are hero legends (e.g. "The Tale of Hatim Tai"), there are local legends ("The Treasure Hoard of the Afreet") and local anecdotes ("The Lost Mares"), there are sui generis flights of fancy... All of it is wonderfully well told, with a sense for pacing and a particularly good skill with humorous stories. Alas, for my taste it is often marred by a deep misogyny; this is less evident in some tales than others, but only very few ("Princess Feroza and the Horse Prince", "The Carpet Merchant's Daughter and the Snake") feature a female character who is both an agent in her own story and depicted positively. By contrast there are many that instruct girls that they should want nothing except to please their husbands, or that portray women as frivolous, foolish, and vain. There is "The Warrior's Daughter and the Four Suitors," a short parable instructing a warrior what husband he should choose for his daughter (The one who'll write her love poems? The one who'll give her a comfortable home? No, the one who'll beget warriors on her). The cultural messages throughout are pretty consistent: women are to serve as wombs and obedient domestic servants, and wanting anything else is sinful vanity, which they must often be punished for. That said, I enjoyed this collection tremendously, and consider it something of a model for skillful retellings of collected material.